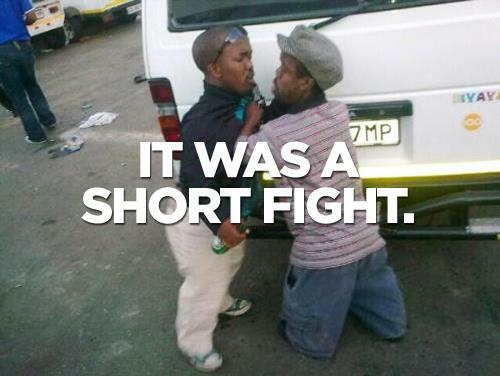 We have been fortunate enough to get our hands on a fantastic photo, it is a still from the shortest fight ever. We don’t know who won. It is a tall order to know all the details. Sometimes we can be a little short on information. Either way that shouldn’t dwarf what is a great photo with two big personalities in it. Perhaps one of them likes to be known as ‘Tinie Tempah’, and the other as ‘Tinchy Stryder’. If you like midget jokes you probably found this funny, if you don’t like midget jokes you probably thought it was terrible. Either way life is to short to complain, check out other hilarious pics in the funny images category.